This week, July 1-3, is the 150th anniversary of the Battle of Gettysburg and it's being commemorated across America and especially at the battlefield itself all week. Unfortunately the anniversary will come and go in Ireland with barely a murmur. Does this surprise me? Unfortunately, no. Yet, the Battle of Gettysburg should be remembered here as should the Civil War generally. The Irish contribution to the American Civil War is simultaneously virtually unknown and grossly and dismissively exaggerated in Ireland. That the American Civil War involved a large number of Irish people and had a huge impact on the million or so post-famine Irish immigrants in America is barely acknowledged. Nearly as bad is the off-handed way some talk about the war as being an almost entirely Irish affair. Such ignorance allows people to dismiss what it was really like for those Irishmen fighting a war to defend a nation that they'd only recently arrived in, a nation that didn't exactly welcome them with open arms. Some Irishmen joined up because it was steady work. Others were simply drafted - they had no choice. Yet many enlisted because they felt an allegiance to the United States because, despite the lack of welcome, they had better opportunities for themselves and their families than they'd have had in post-famine Ireland. A number of those who had gone south fought for the Confederacy for similar reasons. There were also some on both sides of the Civil War who had joined the army because they thought the war would be quick and their military training would enable them to return to Ireland to lead a successful rebellion against British rule. Whatever the reason for joining, they fought and they died in large numbers. Those deaths were felt keenly in the Irish ghettos in America and in Ireland, where family members who remained were left to mourn a death of a loved one in a war they probably only barely understood. 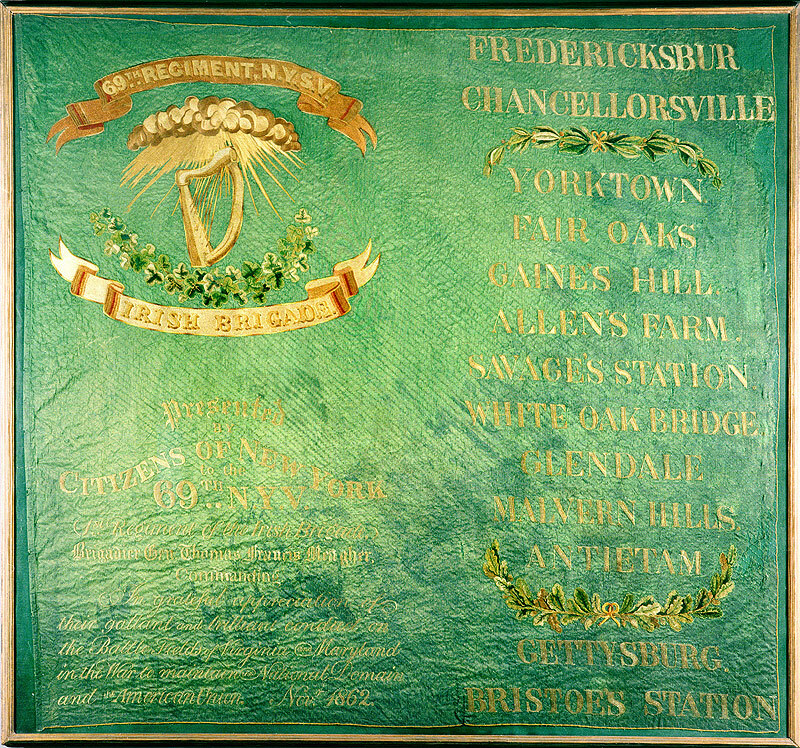 The 150th anniversaries of the start of Antietam and Fredericksburg - the Irish Brigade's worst day - passed without any real acknowledgment in Ireland so I actually expected nothing more this week. I guess there was a small part of me that thought Gettysburg would be different simply because it's better known. The quiet surrounding the Civil War anniversaries stands in stark contrast to the huge celebrations in June to mark the the 50th anniversary of the visit of President Kennedy. There were events in Wexford, the Kennedys ancestral home, Limerick, home to the Fitzgeralds and elsewhere across the country. Just about any place that could claim a connection to JFK or his visit had an official event to mark the occasion. I think it's great that Kennedy's visit is remembered so fondly. His visit was a huge event for the young Irish state at the time, but it would have been nice if they had remembered some of what Kennedy said when he stood before the Irish parliament to deliver a speech that was followed by people across the country via television and, especially, radio. His speech was about the "many and enduring links that have bound the Irish and the Americans since the earliest days." For Kennedy those enduring links were best exemplified by the Irish contribution in the Civil War. He chose to open his speech with a (somewhat garbled**) lesson on the Irish and the Civil War. He then presented a battle flag from the Irish Brigade to the people of Ireland. Maybe that was the start of the problem. That flag was presented to the people of Ireland, but very few of them have ever been able to see it. It hangs on a wall inside the parliament building - Leinster House - where you can only see it if you work there or if you get an invite to visit the parliament. President John Kennedy, June 28, 1963. The Civil War battle flag should be in the National Museum where hundreds of thousands can see it each year. Moving that flag could be the start of a new understanding of the Irish contribution in the war and its impact on the Irish in America and in Ireland. Let's get going. Let's move that flag. ** Kennedy confused the date for the Battle of Fredericksburg, saying 13th September 1862 when he should have said December and put Fredericksburg in Maryland rather than Virginia.